By the end of 2011, Android had captured 47 percent of the base of primary smartphone users age 13+ in the U.S., followed by Apple iOS (30 percent). In the EU5, Android unseated market leader Symbian in 3 of the 5 European markets measured. But the platform race continues to be competitive as other players fight to regain market share. 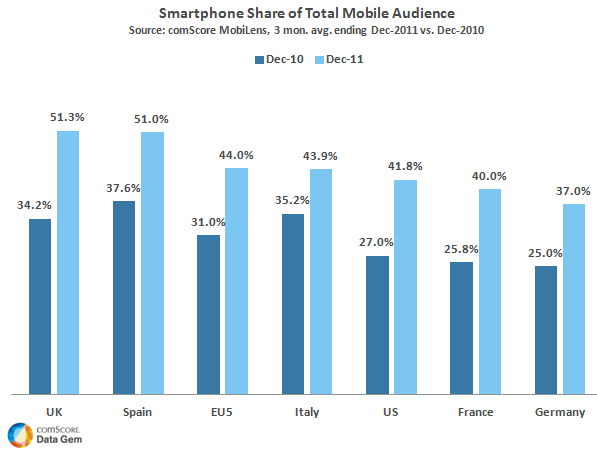 In December 2011, RIM held on to the lead in Canada, albeit followed closely by iOS. 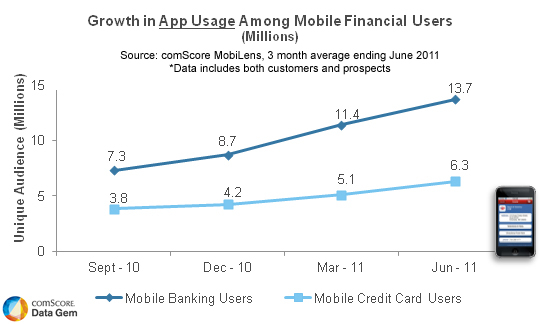 Microsoft took steps to rebuild its share of the market with a Nokia partnership in the works and its new Metro user interface launching across multiple devices.By Q2 2011, banking app usage had risen 74 percent from nearly a year go, followed by app usage among credit card users (up 58 percent). A look at the history of the U.S. smartphone market reveals just how quickly leadership positions can change over time. In 2005, Palm was the smartphone market leader at 35 percent, followed by RIM and Symbian. By 2006, Microsoft had emerged as the leader, only to be surpassed by RIM in 2008. 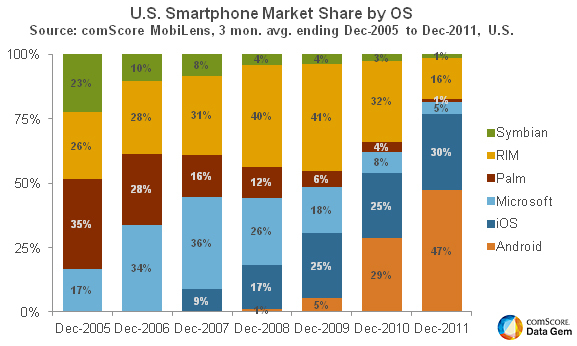 In 2011, Android surged to the lead, followed by Apple. Notably, while the lead has switched hands many times, Apple has never claimed that mantle.